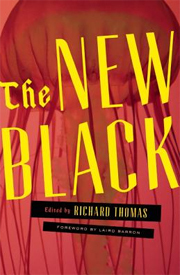 The New Black is a collection of twenty neo-noir stories. That is the promise from the back cover of this new anthology put out by the fine folks at Dark House Press and edited by Richard Thomas. No, not the guy who played John Boy on The Waltons. This cat is cooler. Way cooler. Now, full disclosure: I have no idea what neo-noir means. I don’t much give a flying fig about genres and sub-genres and their sub-genres. I like good stories, interesting stories. I love strange stories, especially. And I loved this anthology. Loved! After a forward by Laird Barron, we get to the stories. Opening with a tragic and deeply troubling tale by Stephen Graham Jones, “Father Son, Holy Rabbit,” which stuck in my head for days! This is followed by Paul Tremblay’s “It’s Against the Law to Feed the Ducks.” Another gut-puncher of a story about loss and regret and fear…and love. I almost jumped ship after this one, as I was not sure I could troop through another eighteen tales of this caliber of heartbreak. But I soldiered on. Lindsay Hunter’s “That Baby” is a sideshow freakazoid parental nightmare. “The Truth and All It’s Ugly,” by Kyle Minor, is a disorienting re-tooling of Pinocchio or Blade Runner. Kind of. Craig Clevenger’s “Act of Contrition” gives faith fangs and something sharper and deadlier. With “The Familiars,” author Micaela Morrissette delivers what is my favorite of the bunch, a stunningly beautiful and terrifying tale of a child and his imaginary friend. Really, this one will knock you out. “Dial Tone,” by Benjamin Percy, is a tale of loneliness and loss of one’s self. Roxane Gay’s “How” is a unique and wonderfully odd little story told in short instructional blocks. Roy Kesy’s “Instituto” is about vanity and its ultimate price. Craig Davidson’s “Rust and Bone” concerns a boxer and revenge. “Blue Hawaii,” by Rebecca Jones-Howe, is a scathing diorama of a deeply flawed pair and their demons. Joe Meno’s “Children Are the Only Ones Who Blush,” is a stunning and strange drama about an ostracized and pained young man and his struggles with getting on in his world. “Christopher Hitchens,” by Vanessa Veselka, tackles faith and loss and stars grief and dolphins. 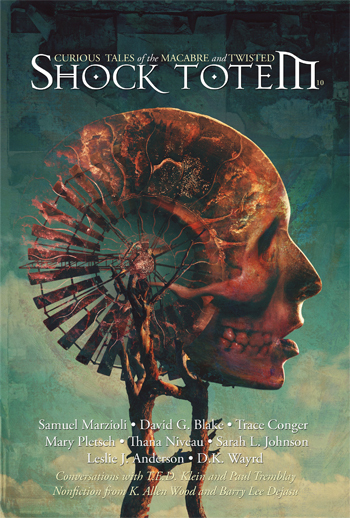 “Dollhouse,” by Craig Wallwork, is an effective haunted house story, and that’s a very simplified synopsis. Trust me. “His Footsteps Are Made of Soot,” by Nik Korpon, is a haunting tale of home surgery, resentment, and mortality. Tara Laskowski’s “The Etiquette of Homicide” is a how-to guide to being a killer for hire. This story has one of the best last lines EVER! “Dredge,” by Matt Bell, shows us a twisted glimpse into the lonely and odd circumstances of a sad man and the dead girl he finds. Antonia Crane turns in the metaphorically titled “Sunshine for Adrienne,” wherein we wallow in the tragic misery of a very broken girl. Richard Lange’s “Fuzzyland” is a brutal excursion into denial and running from yourself. 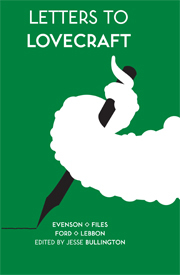 And then we hit the final story, Brian Evenson’s “Windeye,” a delirious nightmare about a house with an extra window. The New Black is a great collection of incredibly unique fiction. I honestly liked every story in here, and I usually don’t say that about an anthology. It was also nice to encounter so many authors with whom I was unfamiliar. A strong compilation of talent. Very strong.